At any rate, this gorgeous Tennessee weekend was a busy one. False Indigo seeds imported from Michigan now bookend our gorgeous Autumn Sage, just upstage from our overwintered Blanket Flowers. Perfect timing, as our daffodils have gasped their last and the tulips are about to say goodnight for the season. Snap dragons augment the perennial pansies and self-starting borage, coreopsis, and zinnias have been transplanted from last year’s flower bed (eventually this year’s tomato patch, if Burpee ever gets around to sending us our starts) into the treacherous front hill. Calling all bees! Lest you think this blog is about pretty things, let me tell you about our beans. We love beans. And, legendarily, POD has had a rough go of growing this ma gical fruit. Last year was okay, at best, if you count black-eyed peas as beans. Which I do. I really do. We managed a few great pesto/bean/pasta meals featuring the young pods and enjoyed a New Year’s Hoppin’ John feast from our quart of shelled dried peas, but our Royalty Purple suffered from storms and poor garden positioning and our Kentucky Wonders were not so wonderful. 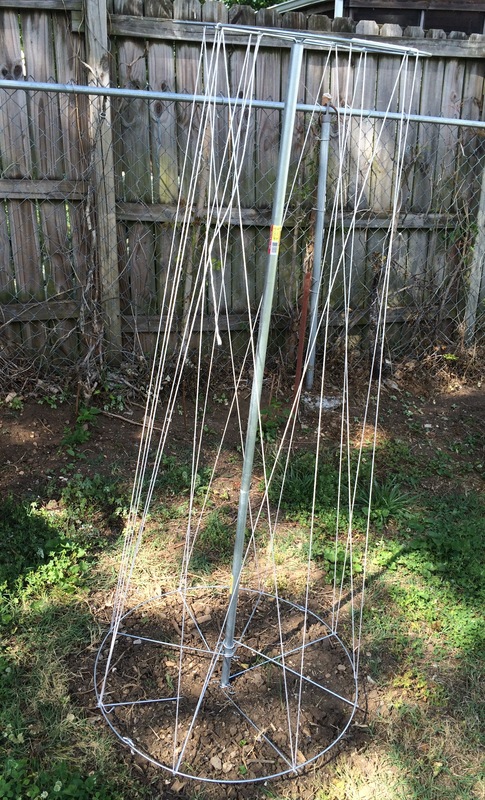 So this year, because I had to spend money on at least one new gadget, we’re going to plant our pole beans around this shiny new leaning tower, a row of faithful cow peas (black-eyed peas) and lima beans already line the property line fence, and a strip of Scarlet Runner bean will, we hope, will multitask as beautiful and bountiful.